Housed in the rooms of the Pitti Palace's Meridian Building, the museum contains fine examples of carriages used by the Lorraine and Savoy courts in the eighteenth and nineteenth centuries and, in the cabinets along the walls, antique harnesses. The oldest carriage, a coupé used for drives in the city, elegantly decorated with rocaille, is datable to the middle of the eighteenth century. Its original owner is unknown, but given the quality of the carriage's manufacture, it was certainly a noble and refined gentleman. 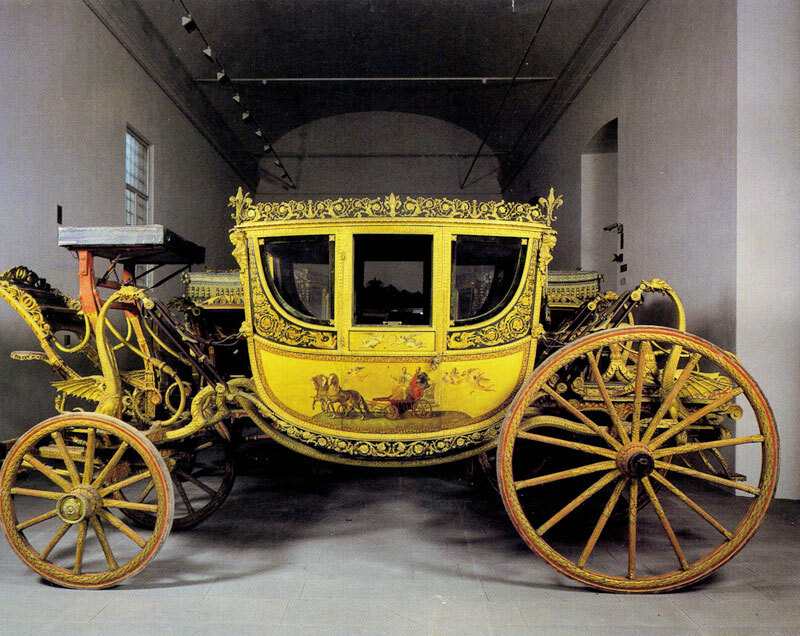 Ferdinando III of Lorraine was very fond of carriages and, upon his return from exile (1816 - 1818), he commissioned the construction of six luxurious berlins for himself and his court. The museum contains three of these carriages, among which is the most important of the six, the Grand Duke's personal carriage, made to be drawn by three pairs of horses (six-in-hand), and the work of various specialised artisans, from Busi and Dani, makers of leather goods, who directed the overall work, to Cioci and Gori, bronze workers, to Paolo Sani, a carver, to the painter Antonio Marini. The latter painted triumphant guadrigas on the carriage's gilbed box. The quadrigas depict Lorenzo the Magnificent and Poliziano, Cosimo I and Giorgio Vasari, Cosimo II with Galileo, and Ferdinando III in glory, surrounded by cupids bearing symbols of abundance, all of which was intended to signify not only the continuity between the two reigning Medici and Lorraine houses but also the enlightened nature and the patronage of the rulers of Tuscany. The sedan chair is older than Ferdinando's carriage, dated 1793, and was ordered by Ferdinando III for his wife, Grand Duchess Maria Luisa di Borbone. The same sovereign also commissioned the 1822 sedan chair, used to carry the wife of Crown Prince Leopoldo from the Meridian Building to the baptistery for the baptism of her first son. 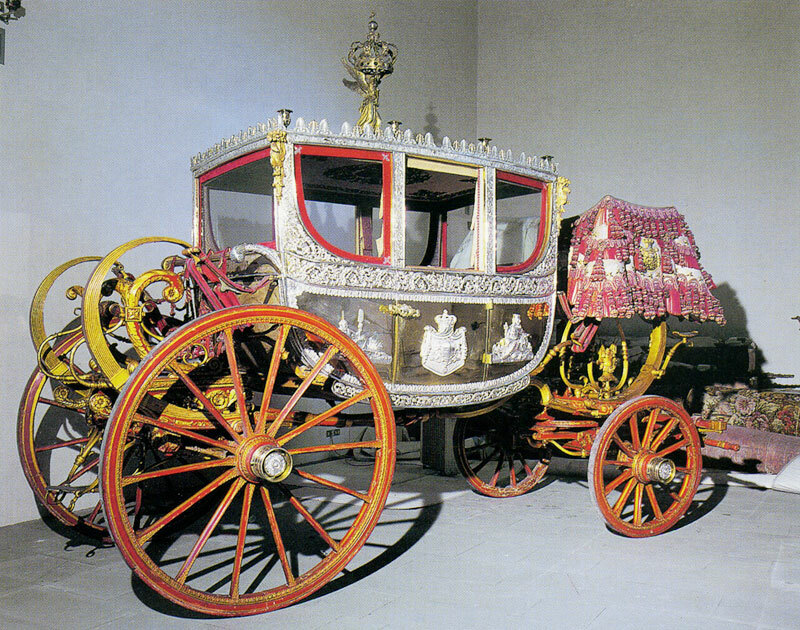 But the museum's most important piece is the silver carriage, like something out of an ancient fairy tale. At the beginning of the nineteenth century, it belonged to the King of Naples, Ferdinando II di Borbone, and was later brought to Florence by the Savoys, who added to it their own coat-of-arms, as a sign of its new ownership.